Hi everyone! Candy here with a really cute idea for a way to store your 1-ounce DecoArt Media paint bottles. Tando Creative has come up with an adorable “Paint Saint With Handles” kit. 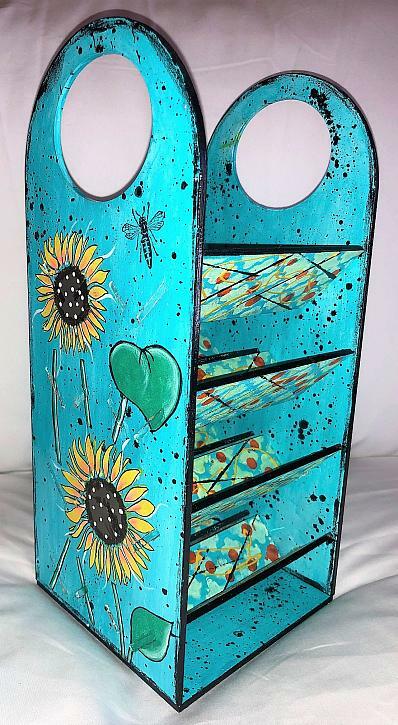 This sturdy piece stands about 11.5 inches tall and holds 32 paint bottles (four on each shelf). The Paint Saint is made of sturdy wood-like material. There are instructions included with this kit for easy assembly. Another thing that I used and absolutely LOVED on this piece is DecoArt's NEW Chalky Gesso. It comes in white and several other colors. Check out DecoArt's website to see more about it. I love this new product because it is thinner than gesso and flows like a dream onto wood, paper and other surfaces. I brushed it on this piece as my basecoat. I also used it to stencil my sunflowers and leaves on either side of the holder. This laid down a wonderful basecoat of white so that my colors were even that much more vivid and easily stenciled over the surface of the gesso. Try it! I think you will LOVE it, too! Here is a list of supplies you'll need to gather and then we'll dive in. Step 1: Begin by laying out all of the pieces from the Paint Saint with Handles Kit. You will be brushing all of them with DecoArt's New White Chalky Gesso. Step 2: Brush all of the pieces with DecoArt Chalky Gesso (white). Let air dry or heat set. After the pieces dried, I sanded everything for a very smooth finish. Step 3: Brush everything with a mixture of DecoArt Fluid Acrylics Cobalt Teal Hue and Titanium White. Use about a 3 to 1 ratio of Teal to White for a bright teal basecoat. Step 4: I regret that I did not get a photo of this step. I simply picked a stencil to use as the first layer over all of the interior shelf pieces. I used a 6x6 latticework type design for the first layer done in DecoArt Media Fluid Acrylics Primary Yellow mixed with a small amount of Titanium White. (Do this on both sides of all of the shelves). Step 5: For the next layer of the shelves, I taped Andy Skinner's Halftone Stencil in place and added DecoArt Fluid Acrylics Pyrrole Orange dots to both sides of all of the shelves to introduce another vibrant color and add more pattern. Step 6: For yet another fun layer on all of the shelves, I screwed DecoArt's Ultra-Fine Writer Tip onto a 2-ounce bottle of Americana Acrylics Bright Yellow (writer tip fits on a 2-ounce bottle) and made random designs on every side of the shelves. Heat set or air dry. Step 7: Finally as the last layer on each shelf, I squirted a small amount of DecoArt Media Fluid Acrylics Carbon Black onto a craft mat and touched it with a straight edge. In this case, it was a hotel key. Then randomly place the straight edge with the paint on it onto the surface of the shelves, making random patterns. At this point, your shelves will look like this. Set the shelves to the side. Step 8: Now working on the two sides and the bottom of the Paint Saint with Handles, you will squirt a small amount of DecoArt Media Fluid Acrylics Carbon Black onto a craft mat and spritz it with water to make a fairly thin wash. Place an old toothbrush into the wash and hold the toothbrush over the teal base of a side. Flick the wash randomly onto the teal surface using your finger and pulling back on just the head of the toothbrush. Repeat this dipping into the wash and flicking randomly onto all sides of the two paint holder sides and the bottom. Let air dry or heat set. Now all of your pieces for the Paint Saint with Handles holder will look like this. Using DecoArt Media Fluid Acrylics Carbon Black paint, place a little paint onto your finger and run it along all of the edges of the bottom, the two sides and all outsides edges of the shelves to give them a nice, finished look. Step 9: Lay the DecoArt Sunflower Stencil (using only the bottom half of the Sunflower stencil) in place on the outside of one of the sides of the holder. Tape it in place and stencil the sunflowers, leaves and stems in place. So that all of the colors will show through vividly, I first stenciled everything using DecoArt Chalky Gesso. Step 10: When that was dry, I dabbed Americana Bright Yellow Acrylic for the sunflowers, DecoArt Media Fluid Acrylics Blue Green Light for the leaves and stems. Remove the stencil and wash it immediately. Step 11: Highlight the center of the sunflowers using a small brush and a mix of DecoArt Media Fluid Acrylics Pyrrole Orange and Titanium White. Use an almost dry brush to blend the orange into the yellow petals. Next, add a touch of DecoArt Media Fluid Acrylics Titanium White mixed with a touch of Blue Green Light to add highlights to the stems and leaves. Let dry. Then outline everything using an Ultra Fine Sharpie Black Permanent Marker. Stamp a little bee on the upper right side using Black Permanent Ink. Repeat this process for the other outside piece of the holder. What a huge difference outlining everything in black makes!! Step 12: Now to glue the pieces all together! First, I suggest that you take an exacto knife and clean out all of the little rectangles on the two sides of the holder so that the pegs on the inside shelves can easily slip into place. I also scraped off the sides of the pegs and edges of the shelves that will slip into the sides of the holder. Sometimes, gesso or paint can get built up on the interior of those little rectangles or on the pegs. Step 13: Attach a small amount of glue onto either side of the peg on the shelf that will slip into the rectangle on the side. Make sure that the larger shelf piece is facing upwards. The smaller shelf pieces are all the same size so they will just slip in. But the larger pieces need to be glued in with the larger side from the peg facing upwards. Lay one side of the holder flat on a table and work slowly. Glue in one section of shelves at a time and be sure that the glue is holding each one securely before moving on to the next section. Step 14: Getting all of the shelves to line up when gluing the other side onto the top of the horizontal holder is a bit tricky. It takes some patience to get all of the pegs lined up and slipped into their rectangular slots. Glue the edges of each peg and slide them in place. I even used a small hammer to be sure that all of the pegs were secure and resting against the side properly. This is such a fun project. It is so colorful and fun! I LOVE the sunflowers on either side. They just make me smile to look at them. Not only is this a cute decor piece; it's also a handy dandy attractive way to store and display your 1-ounce DecoArt Media Fluid Acrylics bottles. Thanks so much for stopping by! I hope you enjoyed this tutorial and it inspires you to let loose and have some fun exploring new techniques and creating something that is essentially YOU! Wow! This is such a bright, happy piece! I love all the layers of stenciling, paint "doodling" and the gorgeous sunflowers. I love it when function and beauty come together in a project, and Candy has really made that happen. Thanks for the detailed tutorial and tips!